Our residence and particularly the apartments represent a typical mountain environment and are designed to offer you every comfort. Every apartment has a reserved parking space in our covered garage, which is close to the ski room used to store boots and skis in winter and cycles and mountain bikes in summer, this area is covered with surveillance cameras for security reasons. Baita Antlia offers a breakfast service from 7.30 to 9.30, where you you will find a rich buffet with cereals, yogurt ,cheese, cold cuts(salami ham) , fresh juice, brioches, cake, white and brown bread rolls, sliced bread for toasting, various jams and honey, coffee, tea, cappuccino, milk and hot chocolate. Furthermore, our residence also offers a bar and "stube" where you can refresh yourself with a drink, have coffee or enjoy great aperitifs and appetizers. 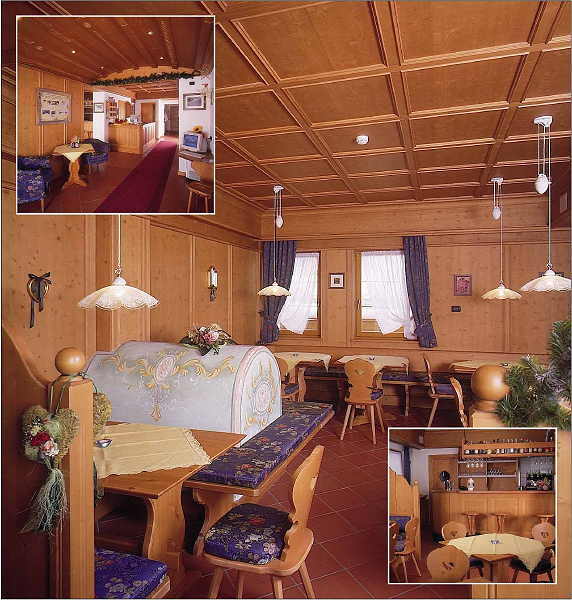 In our Stube, furnished in the traditional Ladin style, you can read a good book, have fun with board games or simply spend some time socialising with friends.